Some people like white meat, others like dark meat and then there are those who love roast chicken for its crispy skin. In this week’s episode of Mad Genius Tips, F&W’s Justin Chapple reveals a must-master skill for getting especially crispy skin. Here, five more recipes to try. In this comforting dish, the classic Greek egg-and-lemon soup is turned into a lemony custard and topped with shards of crispy chicken skin. 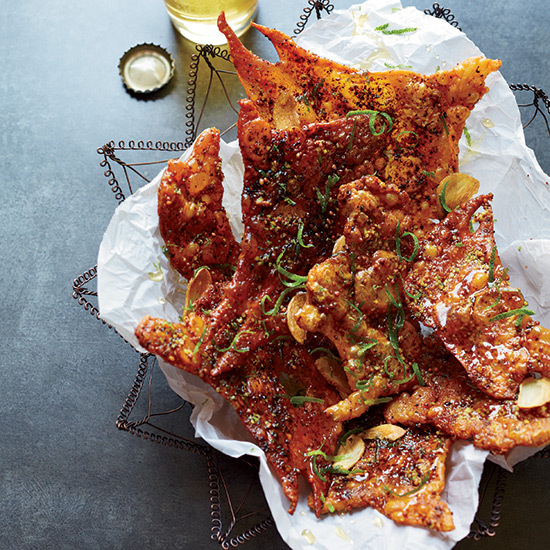 Proof that crispy, sweet-and-salty chicken skins are even better than fried pork rinds. Roasting a whole bird on the grill over indirect heat results in crackling, crisp skin and moist, tender meat. Super-crisp chicken cracklings add terrific flavor to tacos. The incredible skin on this chicken is nicely spiced with paprika, garam masala, cumin, coriander and turmeric.